Looking for a Pink iPhone 5 Lightning cable for the iPhone 5? Chromo Inc. has got you covered. They have a set that is currently available on Amazon for $16.99 and is eligible for FREE super saver shipping. It also qualifies for FREE shipping under the Amazon Prime. This set includes a pink Lightning to USB cable, a pink USB wall Charger, and a Pink USB car charger. If you are into pink, this is the perfect setup to have. Lots of people are switching out their front LCD on their iPhone and changing it to Pink. If you have a pink iPhone 5, be sure to get pink cables to go with it! 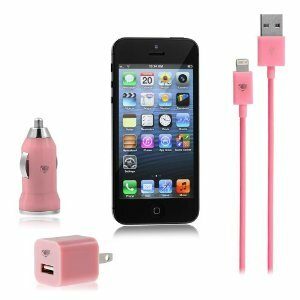 Let us know what you think of the Pink iPhone 5 lightning to USB cable in the comments below.